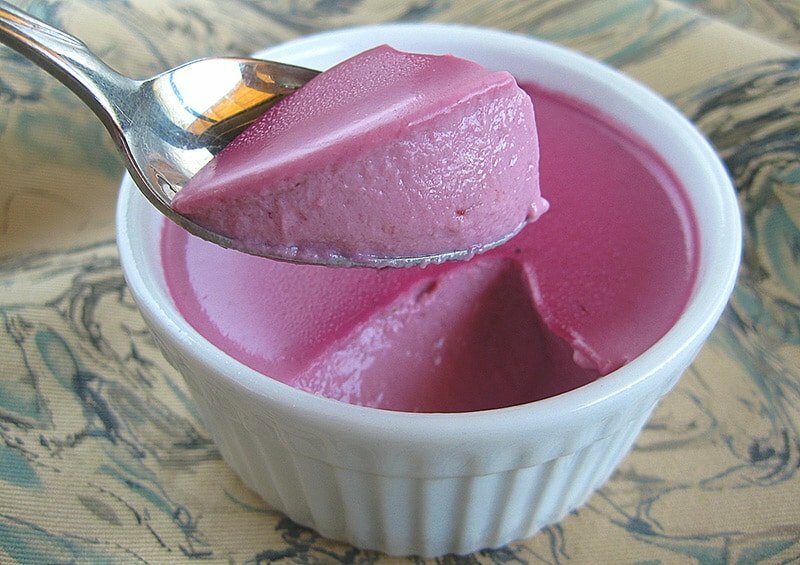 Most recipes for berry panna cotta simply have you drizzle a little berry syrup over a normal vanilla panna cotta. This recipe is different. 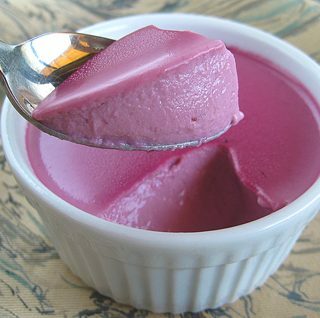 Here I infuse the blackberries — you could use raspberries or any similar fruit — in the cream to make a pretty pink panna cotta. You can also garnish with some fresh berries and drizzle some blackberry syrup over it, too, if you’d like. You can make this up to two days ahead, making panna cotta one of the less stressful “fancy” desserts. You can also choose not to pop it out of the ramekins, which makes it even easier — then it’s like a cream-based jello, only less firm. The goal of a panna cotta is to use as little gelatin as you can and still have it set up fully. I have tinkered with Knox gelatin to the point where I like this, but I notice different brands of gelatin act differently, so you might need to experiment. You can use most berries for this recipe. Raspberries, salmonberries, loganberries, etc., are perfect, and you can also use gooseberries, blueberries or currants. Same basic procedure. Mix the blackberries with the sugar and let sit for 30 minutes. Meanwhile, oil the ramekins with the grapeseed, or any neutral-tasting oil. You can skip this if you are planning to serve the panna cotta as a parfait, and not pop it out of the container. Heat the blackberries-sugar mixture with the cream and bring it to a steam, about 170 degrees. Don't let it simmer. Turn off the heat and let this steep 30 minutes. When the 30 minutes is about done, mix the gelatin with the cold water in a container you can pour from, like a large measuring cup or a bowl with a pouring spout. Heat the cream mixture again, just back to the steaming point. Don't simmer it. Set up a fine-meshed strainer over the container that has the gelatin in it. Pour the hot cream through the strainer into the container so you leave the blackberries behind. Now, pick up the strainer and shake it gently over the cream to release some extra blackberry goodness. This is important, as this last bit of juice and cream in the blackberries is concentrated and can give you a lot more flavor and color in your panna cotta. Stir the panna cotta mixture a few times to incorporate the gelatin, then pour it into your ramekins. Put in the fridge for a few hours to set. Panna cotta can be made up to a day ahead, just cover the ramekins once they've set. Searching for blackberry recipes and this one caught my eye. Wow! I’m definitely doing to try this with the berries I just picked. I love that color. 😀 Thanks for the recipe! Great recipe! I made my own Panna Cotta from fresh picked Black Berries which grow behind the Mission where I live. Since I had a little bit of Heavy Cream left over I decided to add a little more sophistication to the dessert and then topped off the already delectable dish with a Dark Chocolate Espresso Whipped Cream. I served this at a dinner with friends and they went wild. They wanted the recipe, but alas I refused. Some of the simpler dishes to make that shine so bright are better kept secret. Thanks Hank!